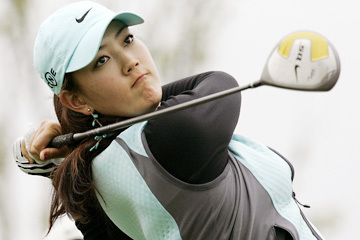 Michelle Wie shot a 69 in Incheon, South Korea, today to make the cut at the men's SK Telecom Open with a 139 total. INCHEON, South Korea » Michelle Wie looked certain to make her first cut in a professional men's tournament yesterday after shooting a second-round 3-under-par 69 at the Asian Tour's SK Telecom Open. Wie is at 5-under 139 after the first two rounds, and is tied for 17th place with play almost completed at the Sky 72 Golf Club course. The top 60 to 70 golfers are expected to make the two-round cut. The Hawaii-born teenager would become the second woman to make the cut at a men's tournament in South Korea after LPGA star Se Ri Pak finished tied for 10th in the lower-tier KPGA Tour SBS Pro-Golf Championship in 2003. The SK Telecom Open is Wie's eighth start in a men's professional event. She played in four PGA Tour events and has also competed on the Japan, Nationwide and Canadian tours, missing the 36-hole cut in all seven tournaments. Since turning professional last year when she turned 16, Wie has missed the cut in the PGA's Casio World Open and Sony Open. Annika Sorenstam became the first woman in 58 years to compete on the PGA Tour when she missed the cut at the 2003 Colonial, shooting rounds of 71 and 74. She has played in men's Skins games the last two years. No woman has made the cut on the PGA Tour since Babe Zaharias at the 1945 Tucson Open. Two years ago, Britain's Laura Davies was given a sponsor's exemption to the ANZ Championship, jointly sponsored by the men's European Tour and Australasian PGA, the first woman to do so on either tour. In the modified Stableford system of scoring, Davies missed the cut with a two-day total of minus-13 points -- 40 points behind the second-round leader.